So, today I'm finally getting around to posting images of the 3D model I've been using for reference during the building of the toolbox. The first set of pictures below are taken directly from Solidworks and were rendered in a quick and dirty way using Photoworks, the inbuilt rendering engine of Solidworks. 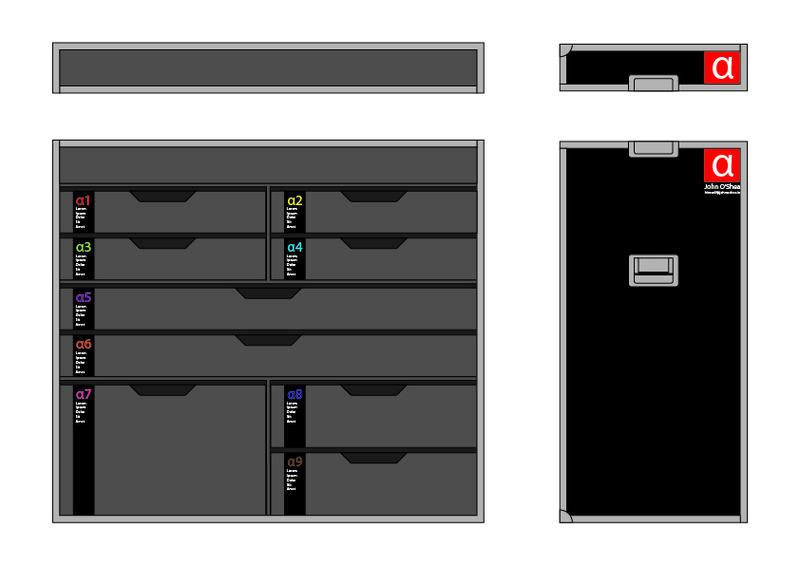 The four images below show the box going from it's initial closed configuration to it's open configuration. While I have been using this model for reference it's important at this stage to say I have updated it since creating these renders. There will be another set of four drawers underneath the original set of four in the box on the left. This is due to the fact that I was originally planning on making a shave-horse but have now opted for the more compactable shave-mule that I spoke about in a previous post. The images below show how the lids can be adapted into a sort of "splash back" for the boxes. I intend to install battery powered LEDs into the lids. This will mean in this configuration they will also provide some downlighting on the top work surfaces. Not shown in this model is the fact that these lids will also be able to be used as stand-alone work surfaces, as honestly I've yet to find the correct solution to enable them to do that. Below are some detail shots of the rest of the model. The materials and lighting don't really show the mechanical components in their zinc plated glory unfortunately and they appear a lot duller than they will in the final box. The aluminium extrusions are also a bit shinier in real life than they appear in the renders. The sandy finish on the boxes is supposed to be a birch texture though it lacks grain and a bump map which would be applied in better renders. I've since decided to spray the interior of the box to protect the internal components from damage, which I'll talk about a little later. Below is a slightly fancier test render I done in Cinema 4D. The aluminium here is a little too shiny and again the zinc plated components like the locks and handles dont quite have the lustre that they do in real life but I think it's fairly representative of the final look I hope to achieve with the box. 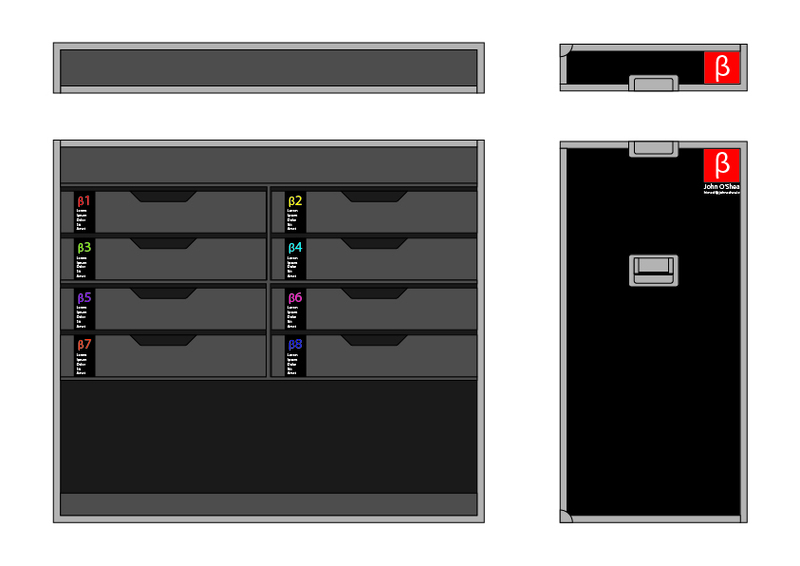 Below are two sample paint schemes I drew up for the box in Adobe Illustrator. While they're functional and clean I may opt to spice the paint scheme up a little, or a lot. It's a work in progress. The important elements are the quick identification of each of the drawers or bins by an alpha-numeric and also an assigned colour. I might chose to liven up the livery by using the assigned colours in a more imaginative way. So there you have it. I have since built the boxes and am currently at the stage of spraying them. I hope my next post on the boxes will be a construction post documenting the cutting, assembly, spraying and cladding of the boxes. For now I'll leave you with this sample of where I'm at laying down the base coats. 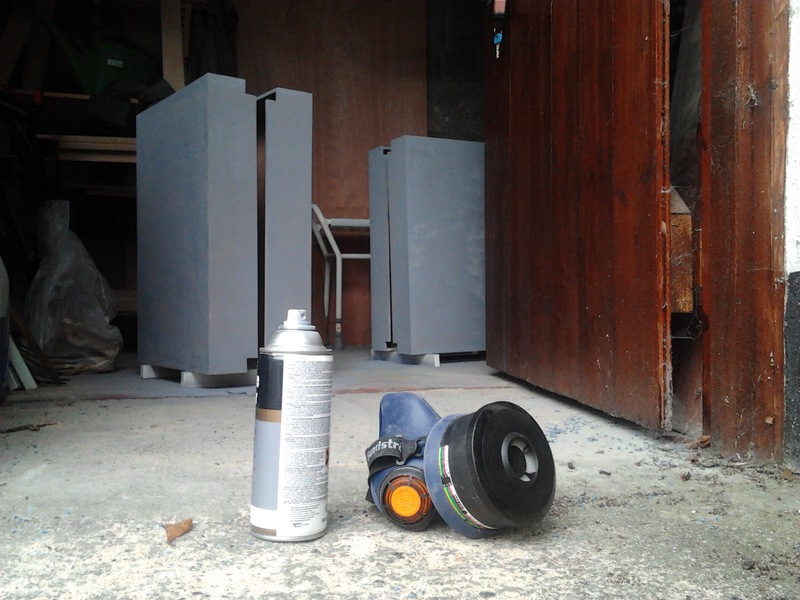 Let the spraying, sanding, spraying, sanding, spraying... continue!